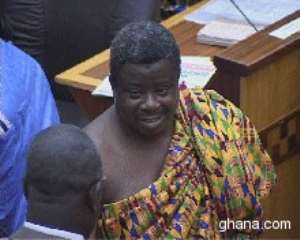 LOCAL GOVERNMENT MINISTER TO QUIT PARLIAMENT WITH PRESIDENT KUFUOR IN 2008 The Minister of Local Government and Rural Development, Kwadwo Adjei-Darko has emphatically declared his intension to quit parliament with President Kufuor in 2008, after their next term of service. "Though the nation and the people I'm serving in my constituency still have the trust and confident in me and I believe they may request for my forth appearance in the subsequent terms, I had pledged to make way for other competent people when I realise that my target had been nearly achieved" he hinted. According to the Minister,also known as the darling MP,he believes his set target would be 100% or 90% materialized at the end of 2008. Mr Adjei Darko also the incumbent and MP-elect for the Sunyani West Constituency of the Brong Ahafo Region made this observation in an interview with the press here in Sunyani at a victory held held in appreciation to his constituents for re-electing him to parliament, for the third time. He announced that three Indian Engineers have arrived in the region to install oil extraction machines at Kwatire near Odumase in the Sunyani Municipality to increase the industrial base in the Brong Ahafo Region. The machines when installed will extract edible oil from sunflower, soyabeans, coconut and palm kennel. The Minister hinted that the establishment of the oil extraction factory is part of the NPP government's policy on poverty reduction to improve the livelihood of the people, particularly the rural poor. He appealed to the youth in the region to engage themselves in the cultivation of sunflower, which would serve as the raw material for the company. He noted that the victory of the NPP is an indication that Ghanaians have confidence in president Kuffour to lead the nation to total freedom and development. Commenting on the package of the positive change chapter two of the government, Mr. Adjei-Darko disclosed that it has been the government's priority to improve upon the living standards of the people through production and capacity building. The government according to him would place high emphasis on the empowerment and development of the unskilled youth and women across the country to facilitate self-sustainability. He added that, school leavers who wish to learn employable skills would be encouraged and assisted financially by the government to boost production and capacity building. Adjei-Darko also said that the NPP government would also take a critical look at improving upon the standard of education in the country. He however, described the just ended general elections as the most peaceful one ever and commended the electorates for their high exhibition of democracy and discipline in the polls. Present at the party were the Brong Ahafo Regional Minister, Nana Kwadwo Seinti, the Deputy Regional Minister, Yaw Adjei Duffour, the Sunyani Municipal Chief Executive (MCE), Ignatius Baffour Awuah, the NADMO Regional Coordinator, Nana Atta Afena and the chiefs and queen mothers of the towns and villages in the municipality.